However, these improvements are concerned only models “home” destination. Of course, they are also suitable for the business environment, but rather in the medium-sized companies: for a small company approach is a little expensive (you can use less compact solution), and may lack the big vPro and others. Actually, the confusion caused in the first models to use just “business” -chipseta together with processors that do not support “business” -technology. By the way, the frequent change of models in this market segment is not desirable: large companies need a long life cycle, which increases the maintainability of the computer and / or the possibility of replacing them with faults. The very same computer at first sight has not changed much – as has been said above, it is still the first generation NUC, all using the same body size 117 × 112 × 40 mm and not more compact and generally revised second. So that on the front surface is the same single port USB. More precisely, it is not the same if the three models of the “first wave” had only USB 2.0, then DC53427HY to “muzzle” the port is USB 3.0. The back wall has also changed. In previous models, is set to either Ethernet connector and two ports HDMI, or Thunderbolt and one HDMI, which leads to unpleasant effects in the form of having to choose either a wired network or a higher resolution of 1920 × 1200. In DC53427HY situation has changed dramatically: with Ethernet and HDMI on board uses two connectors Mini-DP. This allows you to fully exploit the potential of graphics Ivy Bridge, connecting not even two, but three of the display device, and two of them may have a resolution of up to 2560 × 1600. 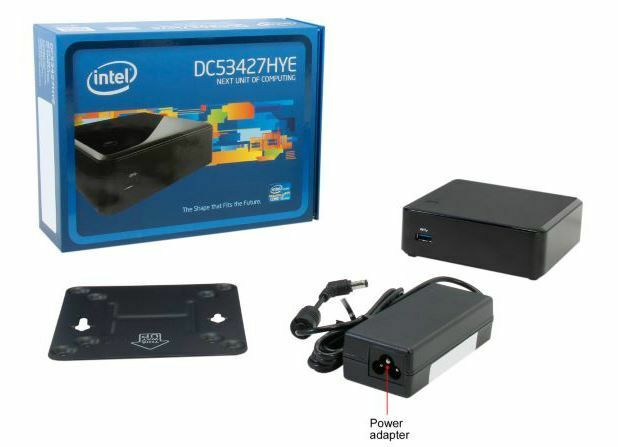 It should be noted that such functionality may boast, not all desktop motherboard with LGA1155 and even LGA1150, and the discrete graphics card budget segment are often more modest ability to connect monitors. It is clear that, in practice maximum configuration will be used very rarely, but the fact of its support interesting. 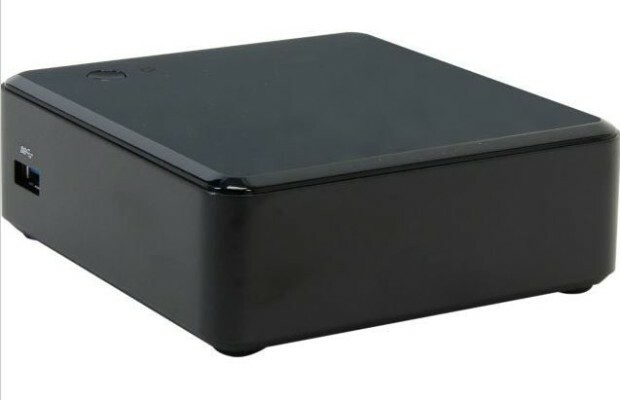 Especially that among the new generations of analogs NUC is no – all models only support two display devices, and they must be connected by means of connectors Mini-DP and quite exotic Mini-HDMI. But in this model, everything is great – and the number (three display devices), and the convenience of switching appliances (full-size HDMI allows you to not look for special cables). The only gripe – only support HDMI version 1.4a, which allows you to get a 4K resolution at up to 30 Hz, but this restriction is peculiar and newer NUC, and not only them.In the coming years, we think it can be neglected – the mass distribution of 4K TVs is not tomorrow, but in the best case, the day after tomorrow. 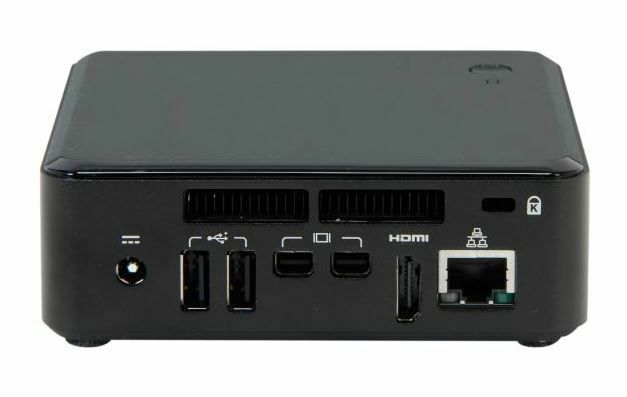 The second and third generation NUC support DisplayPort 1.2, and not 1.1, that problems in practice still does not remove, as this standard is not supported by household appliances (monitor with a resolution of 4K can be connected, but their range is much less than the TVs HDMI 2.0) . Three other connector on the body NUC has not changed. From the entrance of the power supply, however, is different and no one was expecting, but USB is desirable to be modified to support the third version of the standard. Or at least try to increase the number of ports as three ports (total) is not enough for some users. There are, however, a pair of USB 2.0 ports on the motherboard (in the previous models corresponding to the comb was divorced, but not soldered), but use them in a normal case it is not possible (except that connect such exotica as USB DOM). 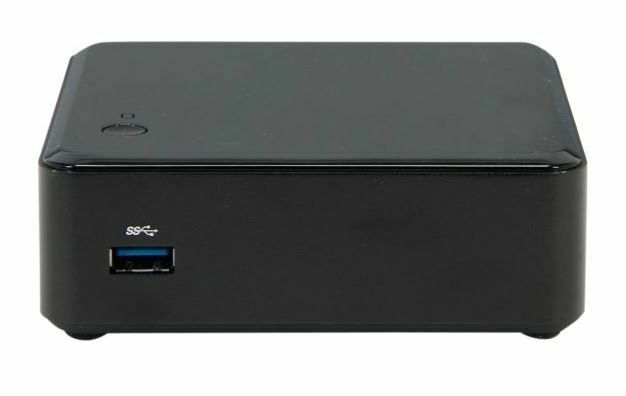 The new models NUC situation slightly changed: in particular, the USB ports was four, not three, but at the cost of reducing the number of displays. Is it possible to combine all the advantages of the families? Time will tell. View from the top board has remained virtually unchanged, and it is no wonder: they actually board the same – except for the fact that, as we have pointed out above, the internal USB port is now fully wired, not only divorced. The lower part of the board (if installed in the chassis – the top) also has not changed (so we decided to do without the photos of her), but the CPU and the chipset got a little better cooling system. The reasons are clear: all the Intel CULV-processors have the same level TDP of 17 watts, but the real heat Core i3 and i5 differs significantly – the first ever operate at frequencies not exceeding the official maximum (for i3-3217U, most commonly occurring in the first NUC, it 1.8 GHz), and secondly, there is support for Turbo Boost, so set in DC53427HY i5-3427U can accelerate to 2.8 GHz. In addition, the maximum GPU frequency and in his case increased by approximately 10%, ie. E. At the same TDP processor needs a more powerful cooling system – or the support of “boost” will have no practical use. Actually, NUC «one and a half” generation was enhanced cooling system. It should be noted that in practice, the changes in the cooling system and its configuration noticeable: in DC3217IY we were able to bring the temperature of the CPU to 71 degrees, the DC53427HY go beyond 66 degrees failed. Still – no noise. However, heating of the case is already being felt, t. E. Not all hot air is discharged to the outside have time during the test, so that the aesthetes may choose to slightly increase the fan speed to increase cooler airflow. However, the direct need for that, again, there is: the temperature of the CPU even decreased slightly. Regarding improvements “bottom”, we practical effect from them could not be detected. On the other hand, and the flaws of the previous version appears only in a very specific embodiment, load – the active use of Wi-Fi and SSD at the same time (for example, when copying files to the device to several gigabytes “air”). From this new variant has several protected only one change in the concept that since choose between a large monitor and a wired network is not required, Wi-Fi is transformed into more optional access method to a network than previously. Model a bit archaic, since it is only the first generation of NUC (albeit with slight modifications) with all its consequences, but had not yet received a full replacement. What’s funny, and performance, too: the most powerful NUC second generation is based on the Core i5-4250U, and although this processor surpasses i5-3427U for the graphic part, this is still not enough for gaming, but it is a little behind in terms of speed of processor cores. The third generation of the situation must be corrected, the benefit of the company promises to finally release the NUC at the Core i7 (though CULV), but the appearance of these models in the trading network still need to wait (there will change, except for the platform – we will check in practice). In the meantime, we note that DC53427HY still continues to be one of the most efficient solutions in their class, and mini-PCs with vPro / AMT and so on. P. In general can be counted on the fingers. But some decisions taken in the first generation NUC, were not very successful, but what has changed in the next – we’ll see shortly.